Pictured at top: D’Army Bailey, ’65, LL.D. ’10, P ’00. The late D’Army Bailey ’65, LL.D. ’10, P ’00, was many things in his storied life: judge, activist, author, father, husband, and Clarkie. the creation of a fund in her late husband’s name. The memory of the man who assumed those roles with strength and grace was celebrated at the Oct. 14 ceremony announcing the creation of the D’Army Bailey ’65 Diversity Fund. The fund supports initiatives and academic endeavors that advance and help sustain an inclusive, engaged campus. Its reach will include providing scholarships to students from historically underrepresented backgrounds who are experiencing financial hardship, assisting in the recruitment and retention of a more diverse faculty, and fostering a more diverse curriculum. President David Angel told the gathering of family and friends inside Dana Commons’ Fireside Lounge that Bailey was one of Clark’s most honorable graduates, and was someone who “helped shape the country and the world.” He recounted how Bailey was expelled from Southern University in Louisiana for leading civil rights protests, refusing to be silenced in his pursuit of racial justice and giving voice to others who joined the struggle. Bailey’s activism did not dim when he arrived at Clark University; he brought Malcolm X to campus for a fiery lecture, and organized student protests of Worcester companies that did not hire or promote African-Americans to managerial positions. Bailey forged a career as an esteemed judge in his native Memphis, yet he never strayed from his activist roots. Among his many accomplishments, he spearheaded the creation of the National Civil Rights Museum in Memphis, at the site of the Lorraine Motel, where Dr. Martin Luther King Jr. was assassinated. He noted the Fireside Lounge and suite of offices on the first floor of Dana Commons dedicated to the University’s educational mission of inclusive excellence — including the Office of Diversity and Inclusion, Office of Multicultural and First-Generation Student Support and Center for Gender, Race and Area Studies — reflect the passion and commitment of Clark students imbued with the same spirit of social justice as Bailey. It was a student-led initiative that spurred the repurposing of these spaces. D’Army Bailey’s son, Justin Bailey ’00, speaks with President David Angel. D’Army Bailey’s son, Justin Bailey ’00, noted with a laugh that when Southern University’s administration made his father the “sacrificial lamb” to appease state politicians uneasy with student protests, he “brought his D’Army Bailey-style of hell-raising up North” in 1962 when Clark students raised enough money to offer him a scholarship. 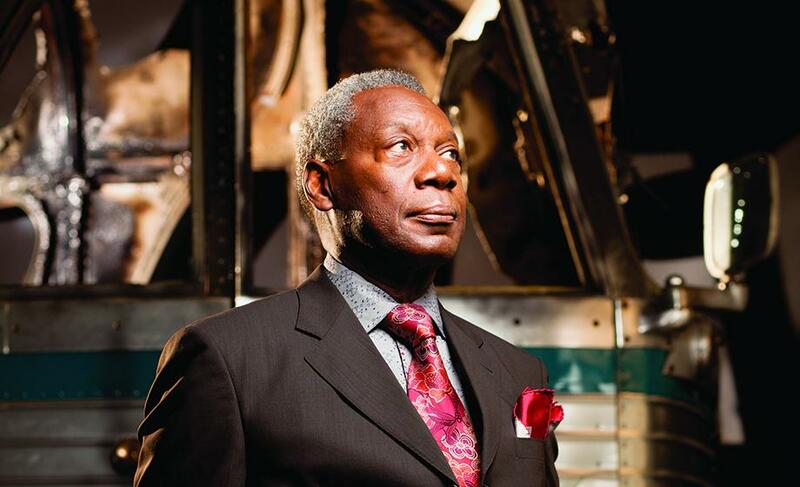 He remembered his father later taking the family to the dilapidated Lorraine Motel to describe his vision for the National Civil Rights Museum, an effort he worked on tirelessly until its opening in 1991. Throughout the program, a video called “Moments in Civil Rights History” history played on a screen in the room. The video, narrated by D’Army Bailey, is a collaboration between the Equal Justice Initiative and Comcast/NBC Universal. Justin explained that the series, featuring 50 vignettes about memorable events and people in the movement, was one of his father’s last projects. D’Army Bailey was ever proud of his alma mater, Justin said. As he battled cancer in the final months before his death in July 2015, he insisted on bringing three possessions with him whenever he was moved to a different hospital room: his Bluetooth speakers so he could listen to jazz, and the decorative bowl and clock he received with Clark’s Distinguished Alumni Award in 2015. A gallery of photos from the Oct. 14 event can be seen here. 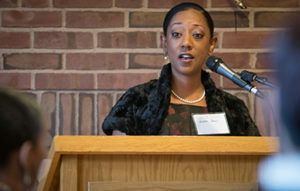 Esther Jones, associate professor of English and director of Africana Studies, described the creation of the Center for Gender, Race and Area Studies, which is designed to “promote and advance the spirit of intellectual activism that D’Army Bailey represents. That spirit persists,” she said. 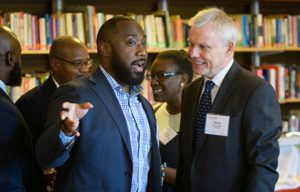 Jones noted the center’s faculty and graduate students would benefit from the fund’s financial support to pursue their research endeavors, which can help retain talented faculty who are recruited to Clark. 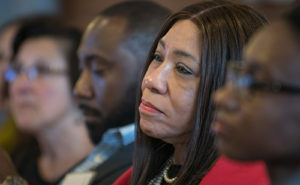 Sheree Marlowe, Clark’s chief officer of diversity and inclusion, began her remarks by noting that the creation of her position was the result of student activism, adding that the sustainability of diversity and inclusion efforts requires making students part of the “strategic fabric of how we operate as an institution.” The fund, she said, will play an important role in buttressing these efforts. Marlowe came to Clark, she said, because she saw a campus “positioned to make change.” She cited several recent initiatives, including the recent rollout of the Diversity and Inclusion Certificate Program for faculty, staff and graduate students, and the recently launched Survey on Campus Culture and Community, designed to gain a deeper understanding of community members’ experiences inside and outside the classroom. 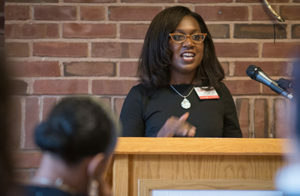 “I’m excited to see how this fund creates an institutional infrastructure for all three of our offices — Multicultural and First-Generation Student Support, Center for Gender, Race and Area Studies, and Office of Diversity and Inclusion — to work together,” she said. Read more about D’Army Bailey’s radical life in this 2010 article from CLARK magazine.